Don’t worry, I am not out of my mind. I still say we should all leave Facebook now. I still promote a way to do it that is jus a tiny bit more realistic and feasible in the short term than almost everything I’ve seen around so far. 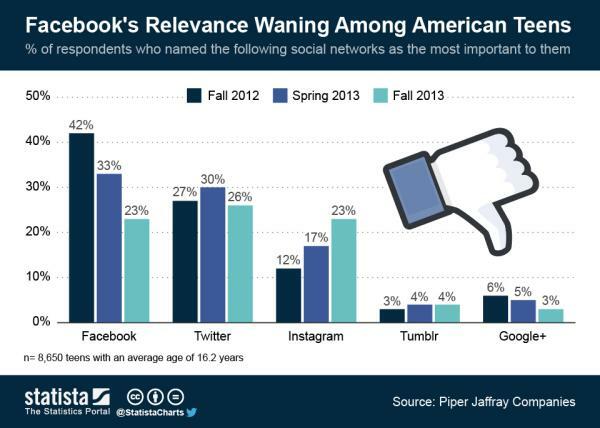 Still, the reasons and the way teens are abandoning Facebook are bad. Or, as a minimum, misreported. First of all, this is not news, but a trend going on by at least five years, as the chart above shows. In the second place, if this is what the media mean by “abandon”, teens are not “abandoning” anything substantial. They are just moving from one cell to another inside the same prison. Instagram belongs to Facebook. Snapchat is, like Facebook and Instagram, a centralized social network based on the principles, that is making money by farming people data. Besides, as long as it is the social network of most people who vote (in the booth or with their wallets, is the same), Facebook remains too powerful for anybody’s good anyway. Same is true for Google, of course. Third, Facebook at least did stimulate (if not require) writing and reading by its users more than its “successors”. In principle, relying on visual communication media and culture much more than on written ones may not be a limitation. Fact is, if someone living today wants to make sense of the world of today rather than endure it, she simply cannot ignore the written word. Today’s heritage, structure, rules… cannot be managed without it, even if one’s only goal is to overthrow them. Maybe the written word won’t matter at all in a couple of centuries. But giving it away now seems pretty dumb to me. « Eric Schmidt's vision about AI may not be "exactly complete"